Submit the form above for immediate access to our network motorcycle salvage yards. 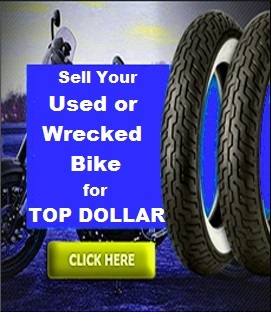 We have a huge selection of used motorcycle parts, in stock and ready to ship at prices far below retail. We will search our huge on-site inventory and network of salvage yards for your used motorcycle, atv parts, utv, dirtbike, or pwc parts. We carry vintage to current year models and offer all makes including Yamaha, Honda, Kawasaki, Suzuki, Polaris, Harley Davidson, Buell, BMW, Victory and many more. Call 1-800-428-7821 or submit the form above. 04 kawasaki mean streak 1600 : Need a set of gauges for my meanstreak 1600 Cosmetic issues are ok.
95 kawasaki vulcan 88 1500cc : I am needing two shocks for the rear suspension, I think mine are wore out. Doesn't matter how I adjust them they still bottom out. Let me know if you have some good rear shocks that would fit this bike. Thank you. 08 kawasaki zx10r 1000 wrecked 10kmi frame cracked front collision have pics how much is it worth to you? 84 kawasaki gpz 750 turbo 11012A 11012-1352 CAP,AIR SCOOP Located on clutch side of engine and is black in color, need it's c=gasket too. 03 kawasaki voyager xII zg 1200 : all around fairing. front, left and right plastic. 97 kawasaki vulcan classic d2 1500 part #21119-1469 IGNITER ,New one is quite a bit and I am looking for a used one. 77 kawasaki kz400d part # 16065-048 duct carb intake boots ... they are discontinued throught the dealership. 10 kawasaki klr650 rim 17\"rim 21\"
96 kawasaki zx9r b 900 21160: CAP-ASSY-PLUG,,This is the insulated connector,from coil wire to spark plug. 06 kawasaki ninja 500r ex 500 Green Ninja 500R. Need front fairing, lower fairing (black), and RH muffler. 99 kawasaki en500 c4 vulcan 500 ltd Head light bucket, gas tank (black), right front turn signal, right mirror and the piece the right mirror mounts to. 07 kawasaki zx6r 600 need a green or black rear seat fairing. 97 kawasaki 1500 vulcan classic Air cleaner case that keeps the cover on. 04 kawasaki zx10r 1000 I am in need of a bottom end of the engine including the transmission. 07 kawasaki zx6r 636 I am looking for a new motor with low miles. Do you or can you do a compression check on used motors?,Thank you. 03 kawasaki kx250 I need an extra top end cylinder. I already have a piston kit. 03 Kawasaki Z1000 Headlight assembly and headlight shroud/cowl in orange. 85 kawasaki GPZ 900 R any spip on's for my ninja Supertrapp preferance. 03 kawasaki zg 1000 concours battery hold down.,Tool kit w/case. 96 kawasaki 750 : The bike is in very good body condition, and the engine is strong. The problem this bike has is the drive shaft and final drive. It has 25,000 miles. I'm looking for $1,300 for the bike. I'm looking to buy a larger bike. 06 kawasaki vulcan 900 The bike has been wrecked but does not show a lot of damage however it is not drivable. My fiance was killed in the accident and did not have any insurance on the bike. I need $725 to get payments started on the remaining balance I have left and need to know by Friday at 5pm. Is it possible to know how much you would buy the motorcycle? 04 kawasaki zx10r 1000 a bottom end of the engine including the transmission. 89 kawasaki vulcan 1500 float bowl between two carbs or carb assy. 01 Kawasaki Concours 1000 Support bracket for foot rest. Drivers right side. 05 kawasaki zx10r Speedometer, Stay bracket, right foot peg bracket. other misc. items. 1980 Kawasaki KZ 440 A Carburetor (s) the slide assembly with good rubber. 96 kawasaki vulcan classic 1500 CDI Box for above. Will aslo take a 1997 Also looking for engine for above from years 98-08.